US Bank Balloons, Tunes and BBQ is back again September 4-7, 2013 at the BG-WC Regional Airport benefiting United Way of Southern Kentucky! They’re going bigger than ever this year with more live entertainment and the return of the BBQ competition. 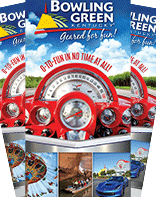 Featured as a Top 10 Festival & Event for Fall 2014 by the Kentucky Travel Industry Association, there’s lots of fun to be had each night of this annual Bowling Green festival. Thursday, September 4, is Kid’s Night! Bring the kids for a carnival midway, ice cream, BBQ (of course), meet the professional hot air balloon pilots and enjoy the late summer evening. Tickets: $5/person. Friday, September 5, is Family Night with tethered balloon rides (weather permitting), inflatables, the breathtaking Balloon Glow, and the return of Bowling Green Idol presented by SAM 100.7 FM. Tickets: $10/person. Saturday, September 6, is a full day of activities! It begins with the competitive hot air balloon fly-in, then the carnival midway opens at noon with the BBQ cook-off category judging soon to follow. The famous Hare and Hound hot air balloon takeoff begins Saturday evening, along with concerts from The Farm, Jana Kramer, and country music sensation David Nail. Tickets: $15/person. 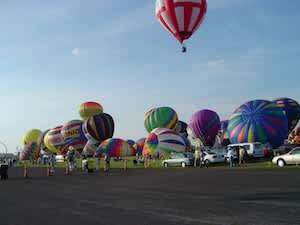 The final competitive hot air balloon fly-in will be in the wee hours of morning on Sunday, September 7. For more information and a complete schedule of events, please visit http://balloonstunesbbq.com/ . If you need me, search the balloons—I’ll be chasing them on Saturday morning as an official balloon crew volunteer. Woo hoo!